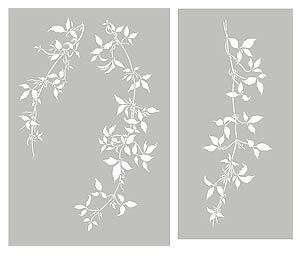 The Trailing Clematis Leaves Theme Pack – part of the botanical stencils range – is based on closely observed and beautifully drawn Montana Clematis leaves – also known as the Himalayan Clematis. 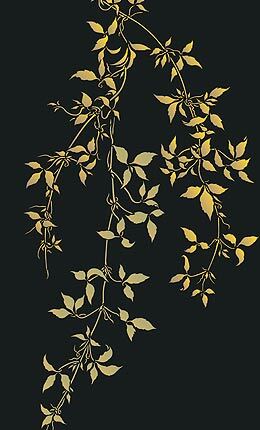 These delicate, verdant trailing leaves are perfect for up-to-the minute leaf stencil designs – fantastic for creating beautiful effects with an elegant contemporary feel. 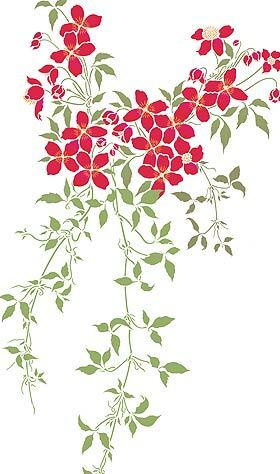 This page features the Trailing Clematis Leaves Theme Pack, a two sheet design containing three delicate strands of this climber, which can be used individually or grouped together in different hanging and trailing arrangements – some examples are shown on this page. 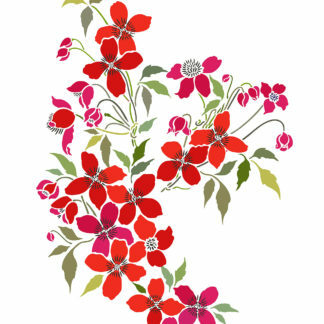 This stencil is designed to be used in conjunction with the Small Montana Clematis Theme Pack to create abundant flowering vines. This design looks fantastic stencilled in natural tones, bright colours, or pastel hues and monochromatic schemes, as well as single colour silhouette effects. Try stencilling diffferent strands in different colours, layering and overlapping to create depth and contrast. 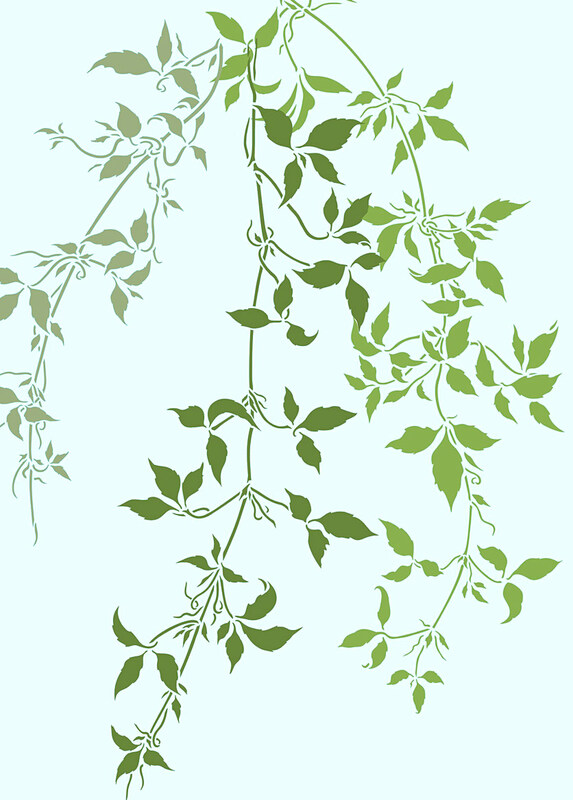 Above and top – different layouts of the Trailing Clematis Leaf motifs; above in Woodland, Hedgerow, Ash Green and Verbena on pale aqua and cream backgrounds. Above – the Trailing Clematis Leaves Theme Pack shown in Agapanthus and Coffee Bean Stencil Paints. 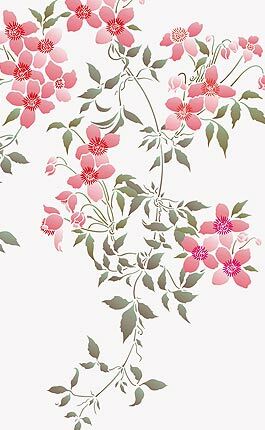 Above – the Trailing Clematis Leaves Theme Pack stencilled with the Small Montana Clematis Theme Pack in Damask Rose, Orchid (flowers), Cerise, Very Berry Stencil Paint (stamens) and Hedgerow, Verbena and Olive Grove Stencil Paint (leaves). 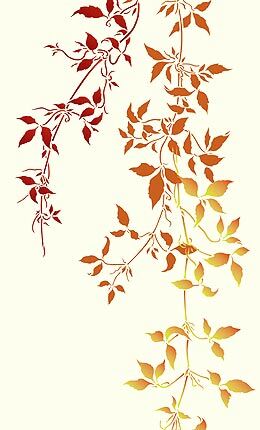 Above – the Trailing Clematis Leaves Theme Pack stencilled with the Small Montana Clematis Theme Pack in Very Berry Stencil Paint (flowers), Harvest Gold (stamens) and Ash Green Stencil Paint (leaves). 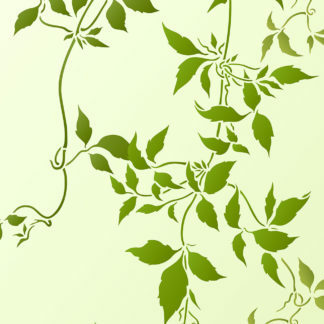 All the Trailing Leaves Stencils can be used together or in their own right. 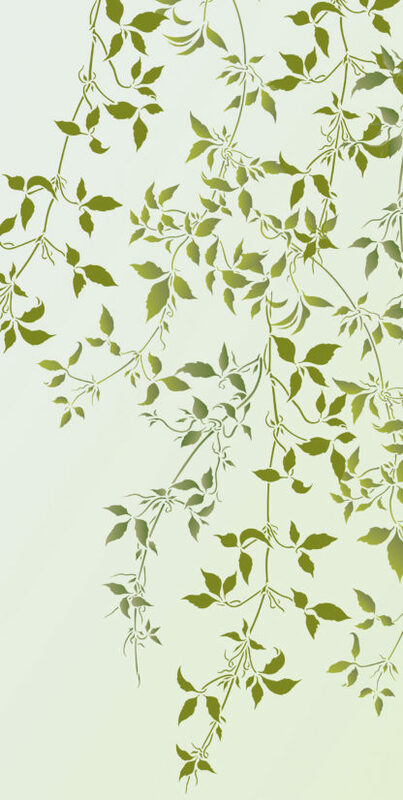 Combining the different designs – different strands of trailing leaves – and different sizes, will allow you to create impressive botanical murals and feature spaces. 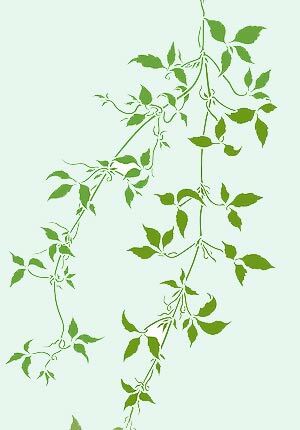 See: Large Trailing Clematis Leaves Stencil. 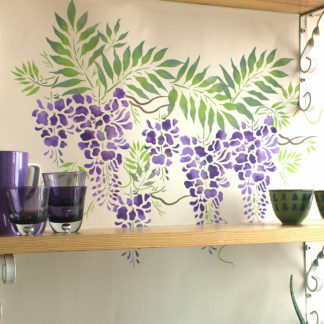 Also see the Grapevine Stencil. 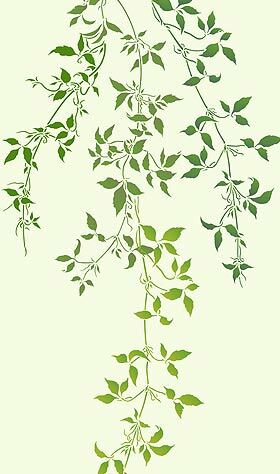 Above – the Trailing Clematis Leaves Theme Pack in Verbena, Hedgerow, Woodland and Emerald Forest Stencil Paint on a pale lime green background. Above – the Trailing Clematis Leaves Theme Pack in Ash Green, Willow and Verbena Stencil Paints on a pale green background. 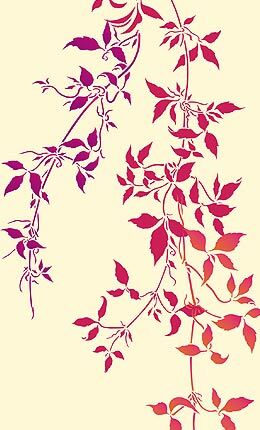 Above – the three strands of the Trailing Clematis Leaves Theme Pack in Raspberry, Sienna and Harvest Gold (shown here lightly over-stencilled or ‘blushed’ with Cinnamon). Above – Create this Chinese inspired look by using our stencil paints on a black surface – the three motifs of the Trailing Clematis Leaves theme pack positioned loosely together and stencilled in Grassland, Latte and Harvest Gold Stencil Paints and over-stencilled with Antique Gold Metallic Stencil Paint – all on a black lacquered background. Use Acrylic Gloss Varnish to finish the look. 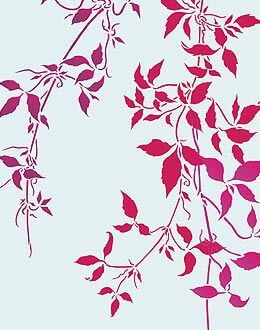 Above and below – the three strands of the Trailing Clematis Leaves Theme Pack grouped together and stencilled in Cerise, Indian Purple and Seville Orange Stencil Paints. Above on a cream background and below on an aqua background. Sheet 1: The two Trailing leaf motifs are 55cm (21 1/2″) long x 24cm (9 1/2″) across at widest points and 38cm (15″) long x 17cm (6 3/4″) across at widest points, on a sheet size 62cm (36 1/2″) deep x 42cm (16 1/2″) wide. Sheet 2 The Trailing leaf motif is 54cm (21″) long x 19cm (7 1/2″) across at widest points, on a sheet size 60cm (23 3/4″) deep x 30cm (11 3/4″) wide. 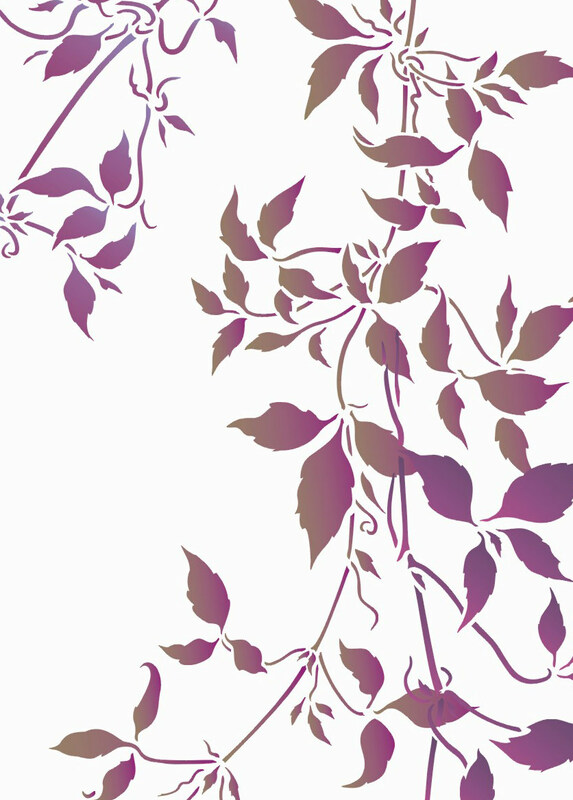 Left – layout of the Trailing Clematis Leaves Theme Pack.